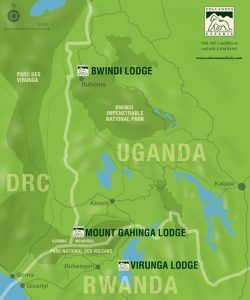 This short & sweet stay offers the opportunity to engage with the endangered mountain gorillas and the local community, and is the perfect addition to any larger Africa itinerary. As the premier luxury destination for tracking the endangered mountain gorillas in Rwanda, Virunga Lodge offers guests unparalleled panoramas, beautiful accommodations, and personalized service. Arriving in Kigali you will be welcomed by your expert guide who will provide knowledge and assistance throughout your safari. Set off for the Volcanoes Virunga Lodge. Enjoy your pre-dinner drinks on the terrace with stunning views of the Volcanoes or warm yourself inside by the roaring fire.